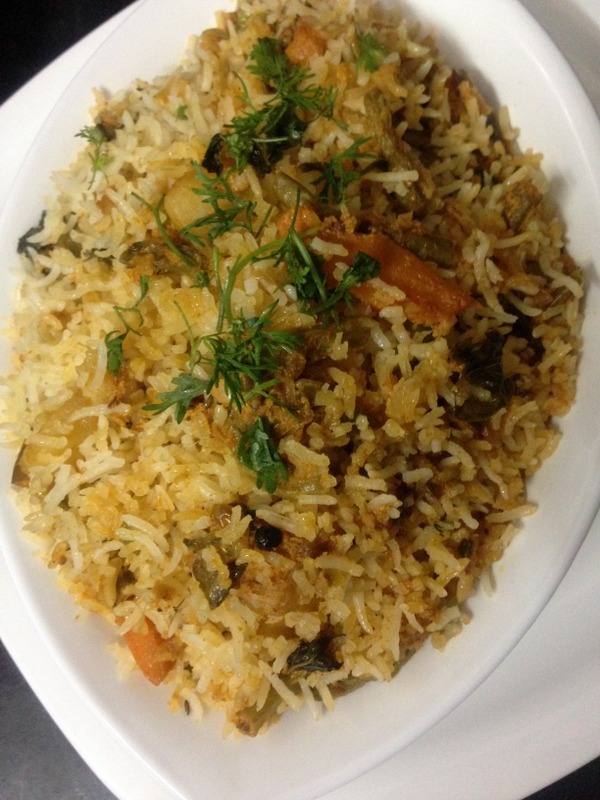 Hyderabadi veg dum biryani recipe is another authentic veg biryani recipe totally in dum style from hyderabadi cuisine cooking in our traditional dum method. The hyderabadi vegetable biryani goes perfectly along with mirchi ka salan hyderabadi style, hyderabadi bagara baingan, pyaz ka raita or kheera raita. 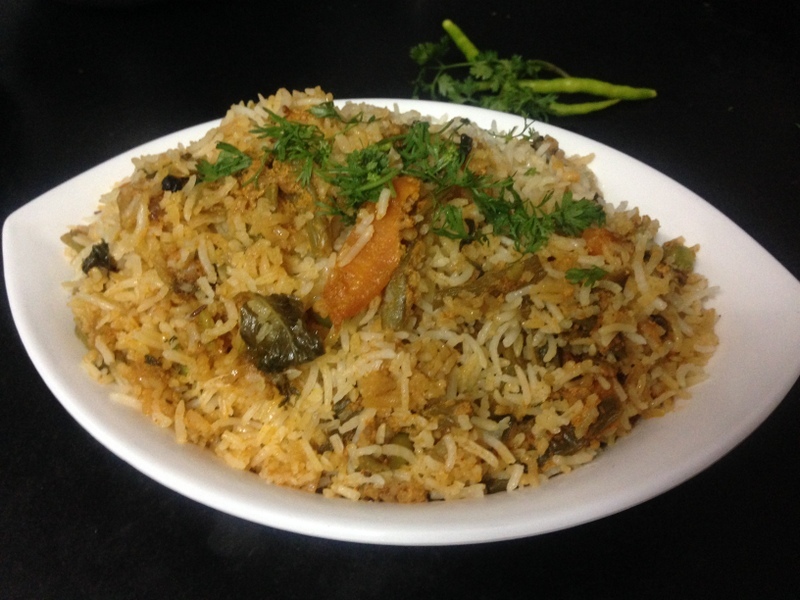 This hyderabadi veg biryani or hyderabadi vegetable biryani recipe is a slowly cooking method where the preferred vegetables are stir fried and mixed with all the spices to make a sabzi masala, mixed with half cooked rice and placed on dum and this biryani is usually referred as tarkari ki biryani or sabzi biryani. If you are looking for hyderabadi biryani recipes then do try hyderabadi style chicken biryani in dum method, hyderabadi mutton biryani dum method, and also read mutton biryani which does not take long time to marinate and it is mutton dum biryani recipe marinated using papaya paste. The vegetables to be used in hyderabadi veg dum biryani recipe are aloo(potatoes), carrots(gajar), peas(matar) mainly and apart from that other preferred veggies are cauliflower(phool gobi), and indian broad beans(seim ki phalli). All these vegetables have to be stir fried well in oil until the raw smell disappears. Vegetable biryani can be made in various versions and here I have made with an almost hyderabadi way of making, that is adding the veg masala mixture at the bottom and adding the cooked rice at the top with seasoning and placing for dum. The veg biryani recipes can also be made by layering the rice along with cooked veggies too but here made without cooking the vegetable mixture. 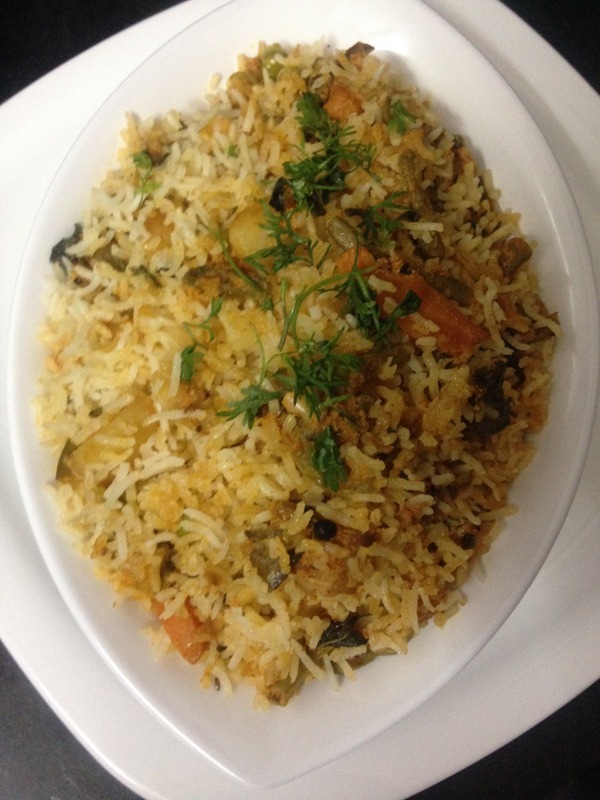 The hyderabadi veg dum biryani goes well with onion raita or hyderabadi mirchi ka salan or hyderabadi baghara baingan. These are the perfect side dishes for hyderabadi biryani recipes. Hyderabadi biryani recipes are the tastiest and easiest in preparation. Once we understand the technique then every kind of biryani can be made with ease and I hope my biryani recipes are clearly understood and liked by my viewers. 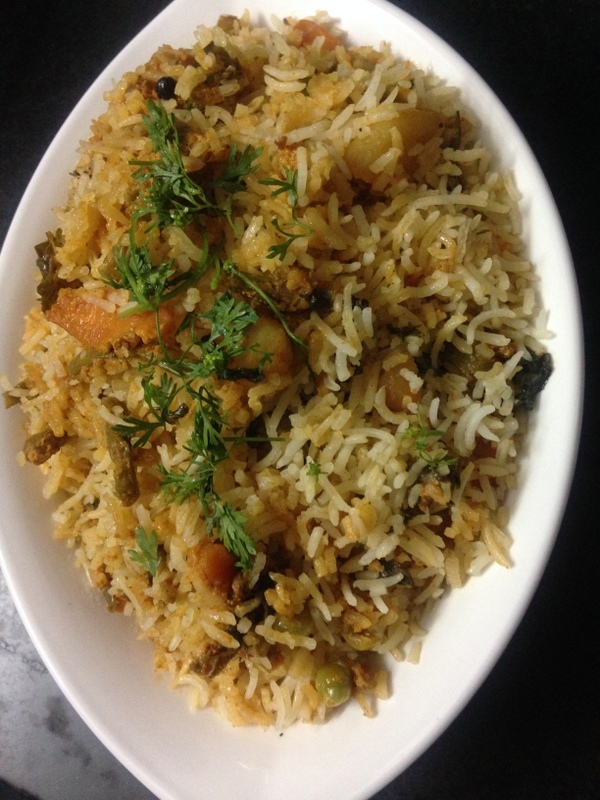 This veg dum biryani recipe too follows a method where beaten yogurt and crushed onions are added into the veg masala and hyderabadi biryani recipes are incomplete without these two ingredients. Firstly chop all the veggies that one would like to add into the biryani. Soak the basmati rice in water for about 30-35 minutes and start preparing the veg mixture. Firstly, in a flat bottom vessel, add some oil and heat it. Into it, add beans and saute till they are stir fried well and color is changed and transfer them onto a plate. Into the same vessel, add sliced carrots and saute well in oil for few minutes to get rid of the raw smell and take the carrots out on a plate. Into the same vessel, add the diced potatoes and stir fry well in oil and take them out on a plate. Into the same vessel, add peas(matar), stir fry for few minutes and take it out. Into the same vessel, add all the stir fried veggies, add green chilli paste, add salt as per taste, add red chilli powder, add turmeric powder, add ginger garlic paste. Add whole spices such as bay leaf, cloves, cardamoms, cinnamon sticks, black pepper corns and kabab chini into it. Add deep fried crushed onions into it. Add beaten yogurt into it. Add coriander and mint leaves into it. Mix the whole mixture well. Add garam masala powder into it and mix. Add lemon juice and oil if required into the mixture(optional) and mix. When the veg mixture is getting ready and rice is soaking, take a cooking vessel, add water generously into it, add salt into it, add whole spices such as cinnamon, cardamoms, caraway seeds, cloves. Also add coriander leaves and mint leaves into the water if required. Bring the water to a boil and add saoked basmati rice into it. Cook the rice until it is 3/4th done and strain the rice completely. Take a cooking vessel, coat the base with oil. Add the whole veg masala mixture into the vessel. Add some coriander and mint leaves into it. Add the whole rice that has been cooked over the veg mixture. Season the biryani to be cooked with coriander and mint leaves, deep fried onions, saffron flavored milk, lemon extracted juice, desi ghee, add little water all over, add some oil all over the rice. Cover the lid of the vessel. Place a tawa on the flame. Place the cooking vessel on the tawa. Seal the lid and vessel with chapati dough or place a weight over the lid. Dum the biryani on high flame for about 15 minutes and on low flame for about 15 minutes. 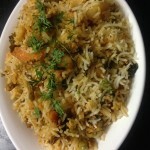 Veg Dum Biryani is ready to be served with raita or any side dish!!! 2.Adding oil in certain steps is very important and not doimg so makes the biryani very dry. 3.Soaking the basmati rice helps the grains to become longer in length while cooking. 4.Preparing the veg mixture without stir frying the vegetables gives a raw taste and it definitely does not give out a good taste to the biryani . If one is looking for a good taste then do stir fry the vegetables in oil. Hello! I like your recipes..:)).. can u upload mandi and khabsa recipes as well…thank you. Really love your veg biryani recipe.. it really came out well. Please post some more authentic veg dishes from Hyderabadi cuisine.